One of the most interesting things in the music business recently has been the return of folk rock acts. 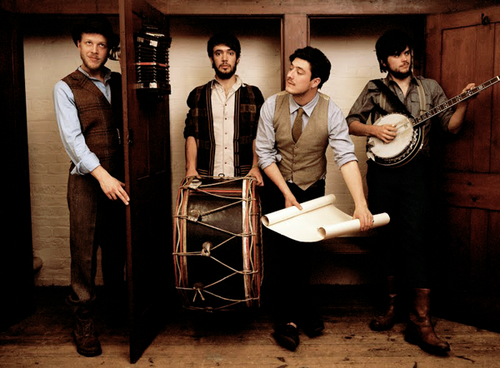 One of the most prominent of these acts is the British four-piece, Mumford & Sons whom have taken the music world by storm selling 2.2 million copies of their debut album, Sigh No More. These numbers are impressive especially with the music business in a huge slump, but also for a debut album that’s unheard of. Fans hopefully will respond with equal or more enthusiasm to their upcoming sophomore release, Babel which is due out September 25th. Yesterday fans of Mumford & Sons got to hear the first samples of the album when the band released their new song, “I’ll Wait.” Upon first listen I really wasn’t blown away, but then when I listened to the song with better headphones I was blown away by the musicianship. The guitars and banjo seem to mix together on this track really well. They only tweak I think could make the song better is if they moved the piano up in the mix more, it would have given the song a lot more movement. Vocally the song is very impressive, and contains many soaring vocals, but also many smooth parts. I’m very happy to hear that Mumford & Sons has a new album coming, and when it is released you can count on me being a first day buyer. This band puts out great music!